For those of you who don’t know Finn, he has had quite possibly one of the most interesting and intrepid careers of anyone you will ever meet. He’s spanned the globe from New Zealand and Australia to Macquarie Island (in the Subantarctic) and Chile. Last year, he played an important role in confirming a successful restoration project on Choros Island, Chile that protected the Vulnerable Humboldt Penguin (Spheniscus humboldti) and Endangered Peruvian Diving-petrel (Pelecanoides garnotii). I am lucky enough to have worked closely with Finn for three years, and while he is indeed a wonder, he does need my help writing this post. I should mention at this point that Finn, the wonderfully skilled Island Conservation project expert, is actually a yellow Labrador who, as a puppy, was saved from an animal shelter. He’s got big eyes filled with devotion and a tail that doesn’t seem to stop wagging, and he happily does all his hard work in exchange for some playtime and a few loving pats. Before coming to work for Island Conservation, Finn spent a few years training in New Zealand with Guus Knopers, where he gained valuable skills he first tested in Hobart, Australia working for the Tasmanian Parks and Wildlife Service. Not long after, he was embarking on a three-day long voyage on the Australian Antarctic Division ship Aurora Australis bound for Macquarie Island to become a key part of the Macquarie Island Pest Eradication Project. Finn, and a team of other specialist detection dogs and their handlers, spent three years on Macquarie Island searching for signs of the last remaining invasive European rabbits, a species introduced as a food source in 1879, but since has been responsible for near catastrophic destruction of the island’s vegetation and the protection it provides the island’s incredible biodiversity. With Finn’s help, the project was declared a success in 2014 and the island is now free of invasive rabbits, rats, and mice. Fresh off the Macquarie Island Pest Eradication Project, Finn and I headed to Chile to assist with the Choros Island Restoration Project – a familiar challenge. Invasive rabbits present on Choros Island were destroying seabird populations by occupying their burrows, increasing erosion, and browsing on vegetation. 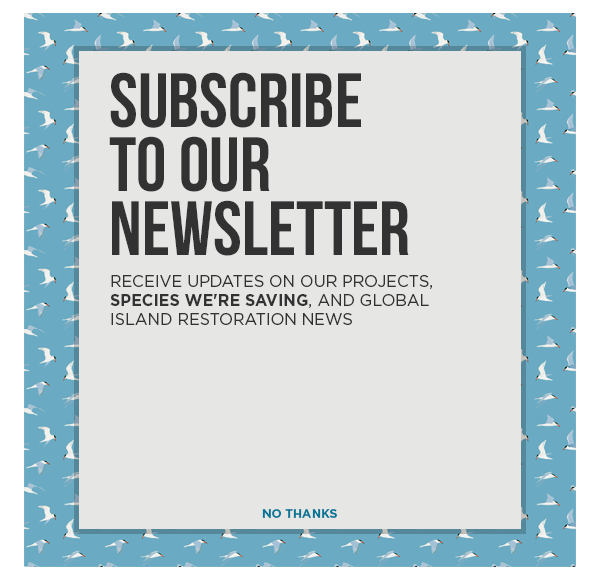 Island Conservation and the Chilean Forestry Corporation, with support from local community leaders and scientists, began removing invasive rabbits in 2013 to protect native seabird populations. Finn began assisting with the confirmation of the removal of invasive rabbits from the island. The smelling ability of dogs is an invaluable conservation tool. They are able to determine the presence of a rabbit with one sniff, often from long distances. Without them, we would be on our hands and knees in the tussock relying on our eyes to spot fresh rabbit scrapings or scats. Finn is trained to indicate the presence of a rabbit by scratching at the ground and is then rewarded with his favourite toy, a fun game, and lots of pats. Choros Island is vastly different from Macquarie, so Finn had to adjust to wearing rubber-soled boots to protect his feet from cactus spines, acclimate to the warmer temperatures, and even learn a few Spanish words. Finn wasn’t fazed by the ‘locals’ on the island – Humboldt Penguins, yuncos, vultures, and burrowing owls that we were working to protect, he just went about his work like they weren’t there. At night, he contentedly snored away (he can snore like a steam train!). Luckily, Finn didn’t find any rabbit sign on Choros, providing confidence that the eradication was a success. There is something very special about experiencing firsthand an island recovering from the impacts of introduced invasive species. Finn and I were only on Choros for a few months, yet were able to observe young seedlings growing and flourishing without the risk of being eaten to the ground by invasive rabbits. It is a satisfying feeling to know that the efforts of many, including some precious four-legged friends like Finn the Wonder Dog, are helping to halt the loss of species and protect treasured ecosystems for future generations. Karen Andrew conservation dog handler on the Choros Island Restoration Project. She is currently based in New Zealand. Born and raised in Sydney, Australia, Karen has a degree in animal science and extensive experience with working dogs on conservation projects. She has a love of islands and traded the warm Australian weather for the sub Antarctic Macquarie Island, and has been island-hopping ever since. Karen is currently based on some special islands in the far south of New Zealand working with Kakapo - a highly endangered and flightless parrot. She fills her her spare time with her many hobbies - from scuba diving in warmer climates, to spinning wool and knitting when in the colder climates.